Creating and then using a household cleaning schedule is one of the best ways to bring your home out of chaos and into order. When you delay, housework multiplies. If you clean up the dishes and put them in the dishwasher immediately after the meal you can just rinse the food off quickly. If you wait until all the food dries on them you have to soak first, and scrub harder. If you dust your kitchen weekly it will take just 1-2 minutes. However, if you wait until all the grease from cooking settles all over the surfaces then you have to scrub and use harsher chemicals to clean the now sticky mess, and it takes a lot longer. Dirt attracts dirt, and clutter attracts clutter. It is called the broken window syndrome. If one window gets broken, and is left unfixed, all of a sudden there goes the neighborhood. If you are still not convinced you should create a cleaning schedule, check out the top 10 reasons to create a cleaning schedule for your home. Everything in your home does not need to be cleaned with the same frequency. In addition, when creating your household's cleaning schedule you should understand the order in which to tackle cleaning tasks, to make sure you use your time and energy efficiently. Use the articles listed above for ideas on what needs to be included in each schedule, but make sure you tweak your schedule to fit your own family and lifesytle. 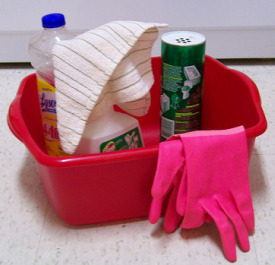 Once you have at least rough household cleaning schedules created you should put them in your household notebook. This allows everyone in your home to look at them, and participate in the process. You will only see positive results if you draft a schedule and follow it, at least most of the time. On the other hand, do not become a slave to your cleaning schedule to the point that you do not have time to do other important things, like spending time with your family. Cleaning schedules are meant to help you "get it done, and have more fun," not to become a means unto themselves. So what if there is an emergency or your sweet little child wants to cuddle with his Mommy? Focus on priorities for cleaning when you are in a hurry, and continue to enjoy your family and your home at the same time. That means your schedules should emphasize the priorities, and then have everything else be extras that would be wonderful to get done, but can be cut out in a pinch. It also means that if your cleaning schedule is 10 pages long you are not focusing on the priorities. Make sure your housekeeping schedule is short enough to actually get done on a regular basis. Want To Share Your Cleaning Schedule With Us?